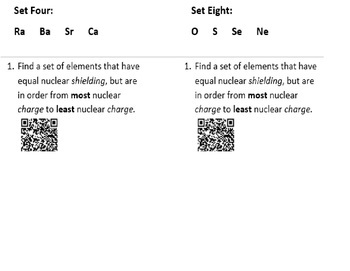 Have your students walk around the room and look at eight sets of element symbols. Can they identify the set of elements that are in order of increasing atomic radius? When they've figured out the answer, they scan a QR code to confirm. Don't like QR codes? You can have students turn in their answers instead. To lengthen the activity, there are 4 questions distributed among students. Have them trade questions and repeat the process until they have solve all four questions! This is a quick activity that gets kids moving around the room! Periodic Trends can be so tedious - why not wake 'em up?! This product comes with teacher instructions, 8 sets of symbols, and 4 different student questions. They are all in WORD format and can be easily edited.